PC/104 is a compact, rugged, easily expandable embedded computing standard based on PC technology. It is an ideal platform for developing embedded systems that will be used in military, industrial, and scientific applications. Stackable You can configure a PC/104 system to meet your exact requirements easily by stacking boards on top of each other. The stacking nature of PC/104 boards makes a PC/104 system compact and rugged, and provides flexibility by letting you choose the boards you need. 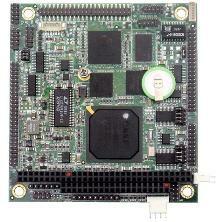 Interoperable PC/104 boards are available in hundreds of flavors from dozens of manufacturers around the world. No matter what you need - CPU, I/O, power supply, communications - you're likely to find it in a PC/104 module. And all these boards are designed to work together, so your system comes together fast. If you need additional functionality at a later date, just add another board to the stack. The rest of your software and cabling remain unchanged. You can even take apart your system and reuse the boards later in a different configuration. Compact PC/104 boards measure only 3.55 x 3.775 inches. This small size lets them fit in tight spaces, such as portable instruments, vehicle engine compartments and dashboards, military vehicles, satellites, and more. For example, Diamond's Prometheus PC/104 CPU was used in a small research satellite measuring only 4" x 4" x 12". No other standard architecture CPU could fit in this tiny space yet provide all the computing and I/O features of our single PC/104 board. Based on PC Technology PC/104 uses the ISA and PCI buses and related processors and chipsets, such as Pentium and other x86 chips. System designers are already familiar with PC technology and components, so they can build a PC/104 system easily. Software developers can take advantage of the huge available and familiar technology base of operating systems and software development tools designed for the PC. Hardware designers can create new products easily by using these familiar and readily available components. This accounts for the large vendor base and wide variety of functions available off the shelf. Rugged PC/104 boards are inherently rugged, due to the pin and socket stacking bus connector system and the four corner mounting holes. This makes PC/104 ideal for harsh environment applications such as vehicles and military equipment, where shock & vibration would destroy a system based on desktop technology. In addition, most of Diamond Systems' PC/104 boards are designed and tested to operate over the industrial temperature range of -40 to +85oC, making them additionally suitable for vehicles and outdoor applications where temperature extremes are common. PC/104 is available in 3 versions with different bus connectors. A standard PC/104 board includes the ISA bus connector at the bottom edge of the board. This connector has 104 pins, giving PC/104 its name. Most I/O boards are standard PC/104 boards. PC/104 I/O boards can be used in virtually all PC/104 CPUs as well as CPUs in many other form factors, including EBX, Epic, Biscuit, and many slot or card-edge CPU boards. This enhanced version adds a 120-pin PCI connector to the top edge of the board for higher bandwidth applications such as video and high-speed communications. Because the dual bus connectors occupy a large amount of board real estate, PC/104-Plus boards are generally reserved for functions requiring the higher data rates available on the PCI bus. Most PC/104-Plus I/O boards use only the PCI connector and retain the PC/104 connector for "pass-through" to the next board in the stack to maintain compatibility with PC/104. The newest flavor of PC/104 omits the ISA connector at the bottom edge and retains only the PCI connector. This was done to provide more board real estate while retaining compatibility with today's advanced CPU boards that provide the PCI connector. Note that a PCI-104 board will not mate with a PC/104 CPU board, since each board has a different bus connector. 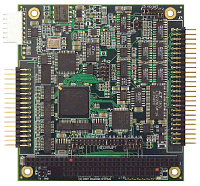 A PCI-104 I/O board can only be used with a PC/104-Plus or PCI-104 CPU. PC/104 boards are assembled into a stack, with boards plugging on top of each other. Each board in the system except the bottom board must be a "stackthrough" board, containing combination male/female bus connectors with sockets on top and pins on bottom. The bottom board may be a stackthrough or a space-saving "non-stackthrough" board, containing female sockets on top and standard solder tail pins on bottom. The assembled stack contains boards with 0.6" 4-40 (15mm M3 in metric assemblies) spacers between them. Assuming a standard PCB thickness of .062" (1.5mm), this results in an overall pitch of 0.662" (16.5mm) board-to-board.